In the rare winds of the Black Rock Desert, sculptures are altered naturally from inert objects on gallery stands to destinations in space, each carrying powerful arcane names and strange wonders. They become whole worlds, mental environments to be acted within rather than artifacts to be acted upon. We conceive Methuselah to hold a strong space, emotionally guiding participants with its imagery while remaining empathically spacious enough to help participants encounter themselves even as they encounter its edifice of steel. With Methuselah we will bring a space which is both beautiful and functional, calm and intricate. As an ancient tree, an icon of remembrance and ancestry our sculpture will already be an invitation out of the world of canvas tents and debauchery. 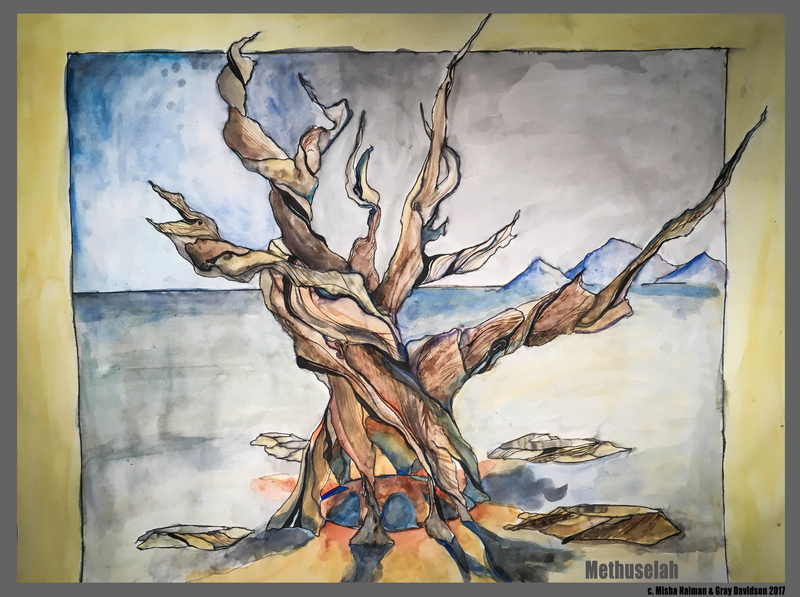 The tree’s roots form organic benches, providing secluded seating for the weary traveler, complex patterns in the bark make Methuselah entrancing to look at and the atypical flame at the sculpture’s heart, another strong symbol of permanence and memory, gives life to the ageless metal. Over all of this, the sound of soft chimes from the branches helps this sacred ground exist apart from the festival just beyond. Art forms an emotional crucible at Burning Man – some works awe and overwhelm us but others harbor and cradle us. Examples of the latter are Rob Bell’s Zomes, Poetic Kinetics Fire in Balance, and Josh Haywood’s Arbor some of which have been sanctuaries for us ourselves in our own hour of need. In 2015 our sculpture The Dancing Serpent called attention to the sentience of desert artworks – entities to be respected and feared. With Methuselah we wish to reemphasize this conscious vision of our built and natural environments, but also to add a sense of the staggering age of the land and the elements, making time a central theme for the sculpture. Our mission is to create works which are beautiful and complex, powered by the elements, but which look as natural in the Black Rock Desert as the earth’s cracks themselves. Ancestry and evolution are also themes for our work, whose namesake’s rings and branches bore witness to the entire span of recorded human history. Great trees gave their limbs and leaves as axles, paper, bows, hulls and roofs, and held space and time for our ancestors’ radical rituals. Mythology is laced with titanic trees such as the norse Mímameiðr, which cannot be harmed by fire and Ygddrasil where the gods congregate. Methuselah will join these giants by dislocating participants from the frenzy of present day time and re-anchoring them in the still time of mythology. The ancestry of temples in Black Rock City has provided a much-needed counterpoint to the constant fugue of bass and propane, but we feel that additional artistic spaces of secular solemnity are needed – places to fall into deeper consciousness without needing to retreat from the intensity of the desert world. The temple itself contains so much emotion that spending time there is often counterproductive for those seeking only stillness. We wish to bring Methuselah as a cloister to respond artistically to this need. 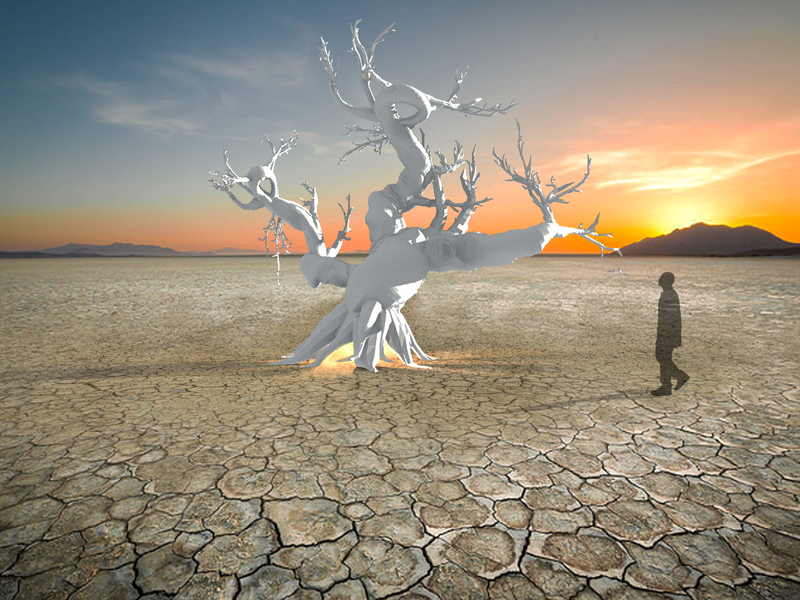 “Methuselah” will be a life-sized replica in steel of the oldest living tree in the world, a 4,848 year old bristlecone pine located in Eastern California. Dimensions will be 15’ high with branches stretching radially 12’ from the trunk. The sculpture’s primary material will be steel, which will be patinated to blues, browns and whites. A flame effect will burn within the trunk, visible through seams of stained glass in the bark and reflected in a large convex mirror among the tree’s roots. Flat areas among spreading roots will form benches and chimes will sound from among the tree’s branches. Methuselah will be constructed first as a steel armature of 2”x2” steel square tubing with each branch containing three lengths interconnected like theatrical trusses. All branches will be securely connected to the tree’s central hub, a strong cube of 2X2 tubing 6 feet above ground level which will be supported along eight roots to the ground. 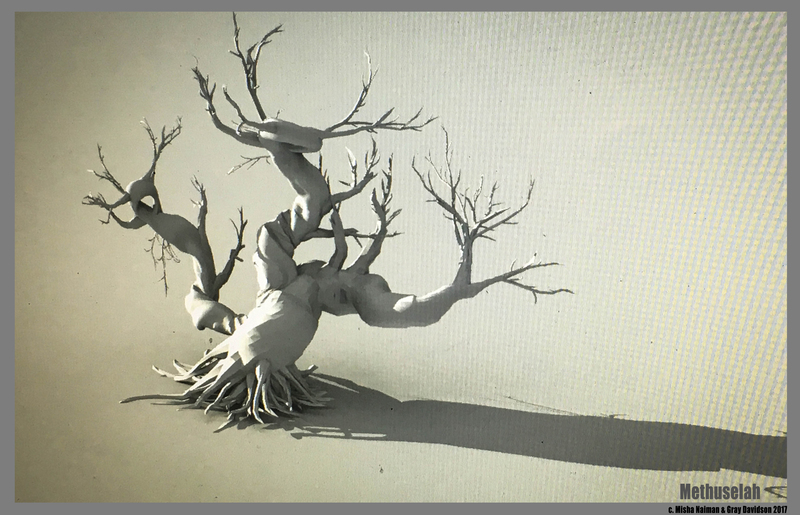 ⅜” steel rod will encase the armature to establish the outer shape of the trunk and branches, while bark made from thin steel plate, rod and tubing will form the skin. The sculpture will disassemble for transport, sections connected by bolted flanges which will be CNC plasma cut from ¼” steel. Methuselah’s bark will be constructed using ½ inch square tube to define curving sections filled either with burls of various diameter steel rod (from ⅛” to ⅜”), patinated steel sheet (1/16”) or veins of stained glass. (Please refer to bark sample submitted in person). The sections made from sheet will be patinated using dye-oxide patina. The eight roots of Methuselah will be welded onto custom 1’X2’ bearing plates CNC plasma cut from ¼” steel. ¾” holes will allow ground anchors to hold these plates to the playa. Each of these bearing plates can safely support 4000 pounds of pressure at its center. Benches will each be secured with three 2.5’ ground anchors. A continuous propane flame effect will ooze from the apex of a concave dish within the tree’s trunk and expand to fill the surface. A 60” convex acrylic mirror will be embedded within the roots reflecting the flames. The flame effect will be fed by three 20 lb propane tanks at a well-lit fuel depot. A manifold will connect all tanks, followed by a ¼ turn ball valve emergency shutoff and an underground hose. At the tree’s base propane will flow through a regulator and another ¼ turn primary shutoff valve. From this point 8 ft. of copper tubing will convey the gas to the effect head within the concave dish. There will be large chimes suspended within the branches. Each chime will be a length of pipe suspended from strong steel cable near its top and these will be arranged around felt-wrapped wooden knockers. All chimes will remain above six feet from ground level. Methuselah’s five benches will be constructed to look like roots which have emerged from the ground near the tree, using the same armature and ’bark’ design as the trunk. The benches will rise 14” from the playa surface and will be capable of seating 2-3 persons each and will have flat top surfaces made from sanded plywood. The bench footprints will be variable, but all will be approximately two by six feet at ground level. Each bench will contain a solar flood light aimed upward at the tree while solar garden path lights will be planted around the outside edges of the benches and the fuel depot. We will bring replacement parts for these lights to ensure the tree is never left dark at night. 3/8″ round tubing, 1/4″ round tubing. The tree will be supported by 8 radial root structures which will attach to eight 12”x24” bearing plates made out of CNC plasma cut ¼” steel plate. Each bearing plate will have holes cut into them to fit one 48” anchor rods. We request that HEAT sink in the anchor rods and remove them during installation and deinstallation. Each of the bearing plates should safely hold 4000 pounds in the center (calculated using .1 inch deflection of material and less than 25% of the yield stress at 8000 pounds safety margin. The deflection is less than 1/4 inch and still under 50% yield stress → within 4000 pounds). The entire sculpture will weigh within 3000 pounds, which means that we are vastly overbuilding the foundational support structure to compensate for burner weight, wind drag and anything else the playa will throw at us. The five main branches will splinter off from the trunk 96” off the ground. The internal support structures of the branches will be constructed from several inter-supporting lengths of 2”x2” square stock, much like aluminum theatrical trusses. The chimes in Methuselah’s branches will wreath the space in subtle, wistful sound, reinforcing the visual invitation to remembrance and meditation. Our sounds will be subtle, audible only by those who approach the sculpture, with a maximum range of 50 ft. or so. Although we expect the chimes to sound both day and night, their intensity will certainly be dependent on wind strength and thus much stronger during the day. Methuselah is intended to be a peaceful location and if we find the chimes to be activated too strongly by the desert wind we will reduce their number or increase their spacing to accommodate the conditions. 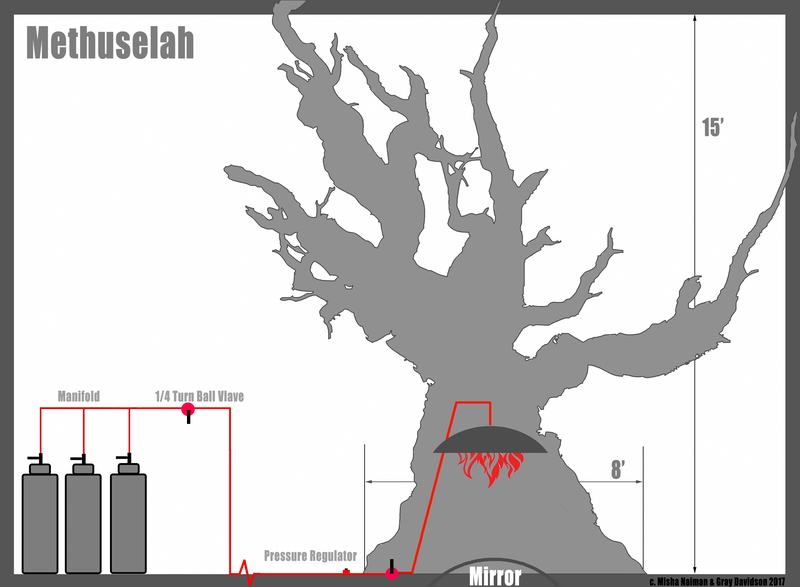 Methuselah will incorporate a single flame effect in the heart of the tree. This effect will not be venturied or pressurized. Propane for this effect will be drawn from three 20 lb propane tanks through a manifold at the fuel depot into a single LPG hose which will run underground to the base of the tree. A pressure regulator will interface between the propane hose and copper tubing terminating in the effect head. A primary ¼ turn shutoff valve will be located at the pressure regulator and another backup valve will be located at the fuel depot. The flames will spread from the effect head at the apex of a metal dome which fills the interior of Methuselah’s trunk five feet above the ground. This effect will be reflected onto a 60” convex mirror positioned at ground level among the tree’s roots. The effect will be lit from 8pm to 1am each night and manned by one crewmember at all times. We know Eric (Propaniac) Smith and Dave Best and can ask them for advice when we need it. 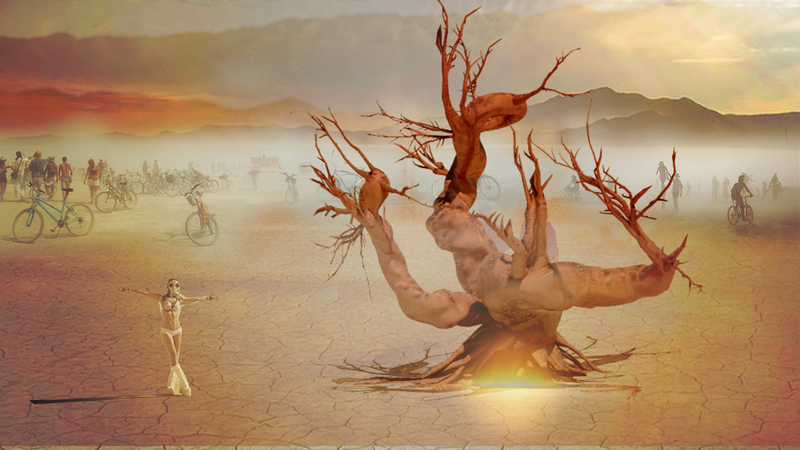 Few modifications will be necessary to re-deploy Methuselah in a new context after Burning Man. 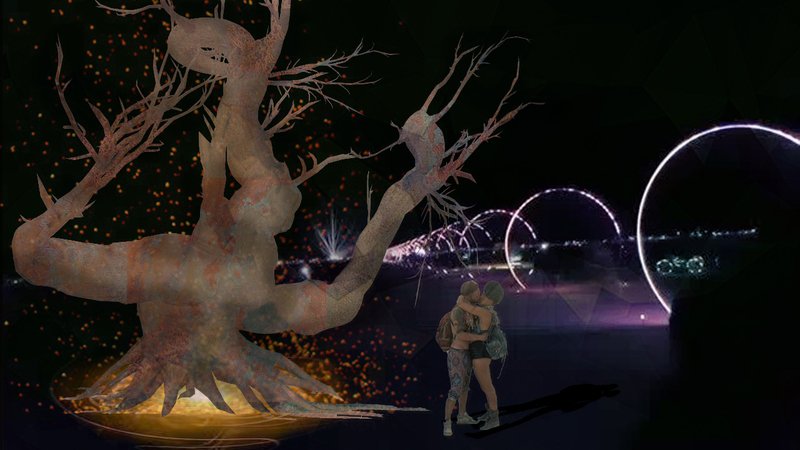 We expect that most venues will not accept fire-related artwork and so we have envisioned the tree’s interior strung with brightly colored LEDs, far out inside its branches, continuing to glow from within through the veins of glass which will run throughout. This change only requires removal of the interior flame shield and propane effects. We have no specific plans at present to take the sculpture to other festivals or to install it permanently in any public place, but the sculpture will be safe, beautiful and non-controversial. Our ideal resting place would be as a monument within Ancient Bristlecone Pine Forest.